PewDiePie lives a pretty exciting life. He's been the most subscribed YouTuber since 2013, he released a book last year, and we'd say he has a pretty sick job doing what he loves. But that doesn't mean that things don't get occasionally strange over at PewDiePie HQ. Some eagle eyed reddit users began speculating how just how PewDiePie managed to get himself unverified. Popular theory is that Felix either changed his handle briefly or set his twitter private and then made it public again. Okay, bit weird. But then Pewds sent out these tweets. Both tweets are quite clearly jokes. 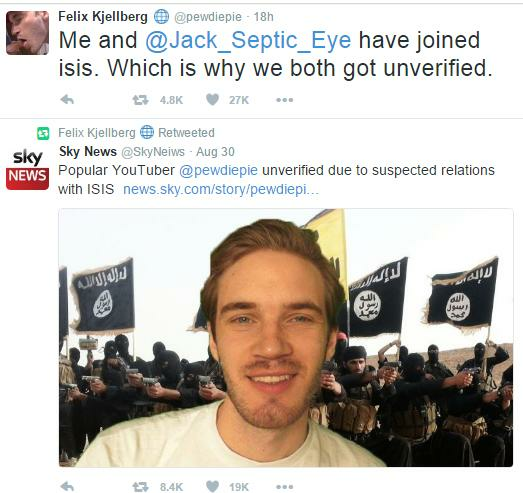 A Sky News parody account tweeted the joke headline of the century when it caught wind of PewDiePie's unverification. PewDiePie's response is also a bit of a piss take but, without the context of the previous tweet,it looks a bit messy. Of course, PewDiePie's fans know his brand of humour quite well so they all joined in on the laughts. But you're never far off from those fans who sincerely want to protect PewDiePie from these wild "allegations". Everyone knows that the internet's favourite conspiracy topics are ISIS and Harambe. The story has become typical fodder and and officially crossed over into Twilight Zone levels of absurdity. Does anyone else miss the days when the internet wasn't so weird? PewDiePie: "Please Stop Coming To My House, It's F*cking Weird"